I grew up here in Wasilla Alaska with Sarah Palin, I thought I had to jump in and have some fun too. Sarah and I graduated together in 1982. She first caught my attention after high school by winning the title of Miss Wasilla in 1984 and then was a runner up in the Miss Alaska pageant. 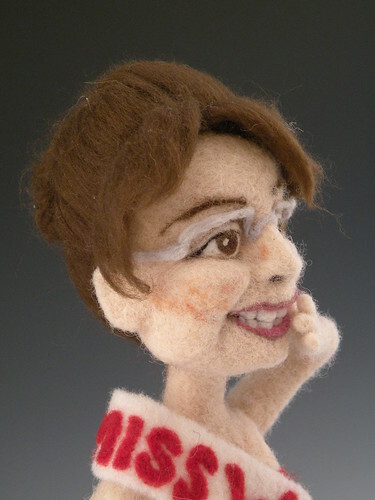 My creation is in homage to my childhood friend Sarah in her Miss Wasilla swimsuit outfit. Laughing already...waiting for the first video to load, internet is slow down here in Haines, AK!